Co-Founder of SheWorx Lisa Wang talks with us about her vision to build a support network for ambitious women entrepreneurs. Lisa Wang is no stranger to a challenge. As a former champion US gymnast and hall of fame inductee, she knows it takes dedication to achieve something out of the ordinary. After spending time overseas and working in startups, Lisa turned to Silicon Valley pitch rooms and started some of her own companies. 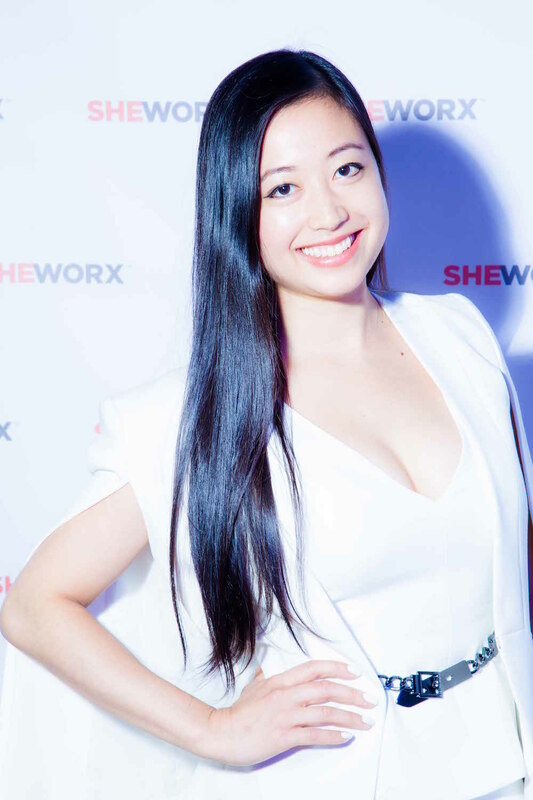 She cofounded SheWorx with Yin Lin, a global collective of ambitious female entrepreneurs redefining leadership. In a little over a year, SheWorx has expanded to four cities, including New York, Singapore, London, and Tel Aviv, where they hold tactical roundtables and summits. Lisa spent some time talking about her company, what has kept many women from reaching the boardroom, and why she regularly looks forward to Justwomen events. Lisa will be speaking at the upcoming Justwomen event in NYC on November 7th. Justwomen is a space for businesswomen to discuss their entrepreneurial experiences. You can request an invite for the event here. Tell me about your company, SheWorx. How long has it been operating and where did the inspiration for it come from? SheWorx has been operation for a little over a year. We founded the company as a passion project in 2015. Since then, we have already launched in 4 global cities, reached over 16,000 women, and curated over 75 dynamic roundtables and educational summits focused on providing women with actionable business strategies and access to top mentors. Everything we do is about providing female entrepreneurs with actionable strategies to build successful and sustainable companies. As serial founders, for my cofounder Yin Lin and I, the inspiration really came when we realized the unique challenges female entrepreneurs face in navigating this ecosystem. The theme for this Justwomen event is about diversity and culture. Can you talk about personal challenges you’ve faced with this in the startup scene, and how that impacted your decision to found SheWorx? For me, it was fundraising in Silicon Valley [and] realizing that a lot of the questions I was being asked and the challenges I was facing came from the fact that I was a woman. Previously, gender had never really factored into my idea of success; however, going through my own fundraising journey made me realize it is markedly more difficult as a female founder navigating the 94% male dominated investor landscape. Objectively, it is just harder for women and minorities to be a part of this homogenous club. At the end of the day, the only way to change the ratio is to actually help more women build successful, sustainable companies. Furthermore, for most women, it’s usually not about the egregious stories you hear in the news, it’s more about the small papercuts that build over time — the assumptions about your role or capabilities within the company, the dance that happens when you’re asked to talk about your company over dinner or drinks. Entrepreneurship is a lonely journey and women aren’t allowed to talk about these things because it can seem overly dramatic. But having to deal with this on your own is inevitably going to impact your ability to run a successful and sustainable company. When we looked at the startup ecosystem in terms of events that were geared towards women, we were looking for a place where we could talk about serious issues but also tackle actionable solutions. We were frustrated that most women’s events would often talk about the problems but never the solutions. At the end of the day, the only way to change the ratio is to actually help more women build successful, sustainable companies. To this end, SheWorx helps serious female entrepreneurs learn the right skills sets, acquire the best mindsets, and gain access to the investors and mentors who will fund and guide them. Sometimes a company begins to take on a life of its own. Has SheWorx changed or evolved in any ways you hadn’t expected? SheWorx really started as a passion project. Yin and I met over dinner and we both expressed our frustrations with the types of events women had available to them. We thought, “Let’s create something!” Within 12 hours we created a breakfast roundtable with about 20 female founders who we thought would be interested. It was a simple breakfast in Union Square, but the discussion was extremely focused. Very quickly, we realized there was a serious need for this kind of community, one for ambitious female entrepreneurs to learn, support, and grow in their businesses. From the beginning, we set a high bar for the kinds of mentors who could host SheWorx breakfasts. Early on, we had mentors like the former CEO of Squarespace, the former CFO of McKinsey and top VC Partners share their expertise. Now it’s evolved into a global community of tens of thousands of entrepreneurs. SheWorx roundtables have evolved into larger summits, called SheWorx100 Summits that have upended the competitive nature of typical conferences and pitch competitions. We focus on genuine curation to match entrepreneurs and investors in active small group discussions that shift the competitive dynamic into a collaborative one. The impact of those SheWorx100 summits is over 25% of the women who attend receive follow up meetings with an investor they didn’t previously have a connection with. Where do you see SheWorx evolving five years from now? Our vision of SheWorx is to be the go-to resource and community for a woman throughout her entrepreneurial journey. It’s a platform where you can bring questions, share actionable stories, gain necessary skills, seek out support, and get access to investors and mentors. Part of that also involves creating a pipeline for the younger generation of female entrepreneurs. That’s why we have a non-profit foundation called The SheWorx Foundation, which will focus on providing entrepreneurial education to younger girls. Women start companies later because as young girls, we’re not encouraged to break the rules or think big, or build things. We’re encouraged to be perfect and follow the rules and everything about entrepreneurship is to the contrary — risk-taking, embracing new challenges, and learning from failure. We want young girls to dream bigger, and embrace their entrepreneurial spirit. What would you consider one of the biggest challenges keeping women and underrepresented groups from earning top leadership positions in influential companies right now? One is the mindset piece, the fact that we’re not asking for more. One woman I recently spoke to — now a COO of a company — was feeling frustrated and stagnant and all it took for her was to finally say, “I want more responsibility. I can do a lot more than I’m being given.” Resolving that challenge is on us. The second piece is how society has almost encouraged women to drop off when they reach a certain age or lifestage.There are minimal support systems actively encouraging women to work more, demand more, climb higher, and in many cases, our communities expect and accept women to lose professional ambition at a certain life stage. In contrast, there are systems in place for men to work more and discourage them from stepping back. You’ve been a regular at Justwomen events. What have you gotten out of attending them in the past? Justwomen events have done a superb job of bringing together really ambitious female entrepreneurs and change makers. It does a great job of addressing a lot of the fears and hesitations and frustrations women have in the space and tackles them head on. I think there’s a great focus on empathetic experiences because it’s very easy for women to feel like they’re dealing with these issues and challenges alone. Being able to hear the stories of the women who have not only experienced it but actively overcome it to become successful is not just inspiration, but it’s actionable and provides a solid foundation for aspiring entrepreneurs. I believe that I, too, can tackle these challenges and I’m not alone. It’s a natural place to foster that kind of connection.